Flexibility and ease-of-doing business are two attributes why our customers state they like best about our company. Vericom is looking to develop a working relationship with our customers to help our customers grow their business. 1. Download, Complete, and Sign the Credit Application. There may be other requests pending a review of the application. Once completed you may mail, fax, or e-mail a copy of each required document. Thank you for your interest in Vericom Global Solutions. For timely processing of your credit and new account information, please make sure to provide all of the required information completely and accurately. Once approved, customers may also purchase directly on the Vericom website. See below for more details. 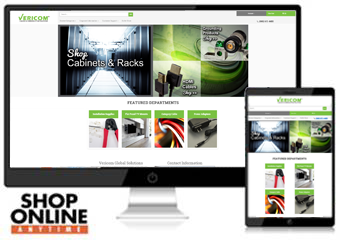 Shop Online with Vericom Global Solutions. Sign-Up Now.